Do you struggle to connect the dots between the Bible and your life? While Christians instinctively want to apply Scripture, we encounter difficulties that can discourage us and diminish our engagement with God’s Word. Indeed, biblical application has suffered in various ways in the church—everything from neglect to abuse to contempt. 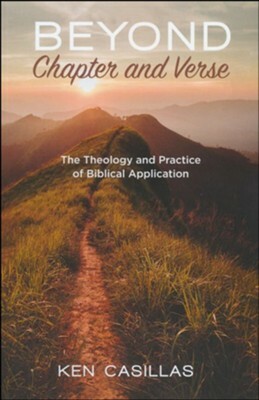 Responding to such challenges, Beyond Chapter and Verse provides a biblically based rationale for the practice of application and then proposes a biblically consistent method for application. The book is substantive but accessible, relevant for believers generally as well as preachers. It begins by sketching the broad theological context of Bible application, relating it to the gospel generally and to sanctification specifically. The heart of the study then synthesizes key Old and New Testament passages relative to the process of application. Building on this foundation, the book sets forth a sensible approach for arriving at legitimate applications of Scripture. A rich assortment of positive and negative case studies illustrates the method, motivating believers to apply the Scriptures for themselves. I'm the author/artist and I want to review Beyond Chapter and Verse: The Theology and Practice of Biblical Application.